The art-studio look of Ten Thousand Things (concrete floors, white walls, glass vitrines), plus its proximity to galleries, adds to the sense that you’re not just picking up a trinket, you’re buying an Important Piece. There are weighty resin cuffs and earrings made from slices of polished agate as well as earrings and necklaces whose curvy organic shapes keep them from being cute. The Victorian, Edwardian, and Art Deco antique and estate pieces that make their way to Kentshire Galleries’ new Madison Avenue outpost have already been somebody’s inheritance at least once, and they’re thoroughly vetted and pedigreed, so they’ve got staying power. 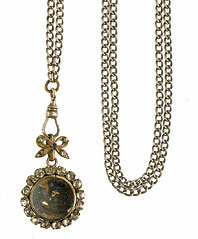 This does not come cheap; an antique pendant starts at $3,000. Think of it as amortization. Hard to reach, but worth it. Owner Russell Whitmore puts wonderfully eclectic pieces from the nineteenth and twentieth centuries next to new Philip Crangi (rings from about $180) and Giles & Brother. The constantly changing stock might include necklaces made from old watch chains that Whitmore has strung together (from about $80 to $300).